Traces the conception and production of the masterwork in kilnformed glass Gateway into Night and takes the reader through the basic concepts of the process of painting with light. Text by Eliseo de Pablos y Viejo, Roberto Vallarino, Lani McGregor, Narcissus Quagliata. 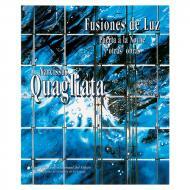 1997 exhibition catalog in Spanish and English, soft cover, 51 pgs, color photos.